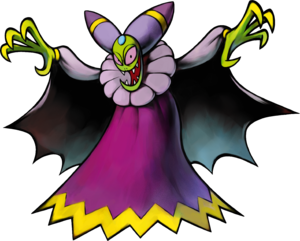 Cackletta is an evil Beanish witch from the Beanbean Kingdom and is the main antagonist of Mario & Luigi: Superstar Saga for the Game Boy Advance, and its 3DS remake. She also appeared as a Sticker in Super Smash Bros. Brawl. Cackletta and Fawful initiating their plan to steal Princess Peach's voice. Fawful and Cackletta telling the Bros. of their plan to awaken the Beanstar. Throughout the whole game, Cackletta is often with Fawful, her assistant. Early in the game, Cackletta disguises herself as The Goodwill Ambassador to steal Princess Peach's voice and uses it to steal the Beanstar. She also replaced the latter's voice with "explosive vocabulary", which is composed of various symbols that drop from her speech bubble to the ground and cause minor explosions. Beanbean lore states that only one with a beautiful voice can activate the Beanstar's mysterious powers to grant any wishes; Cackletta hopes to use this power to conquer the Beanbean Kingdom and soon after, the Mushroom Kingdom. The Mario Bros. go to the Beanbean Kingdom to stop her, and they meet her for the first time on the Koopa Cruiser when she and Fawful come to attack. She later comes to Beanbean Castle Town, attacks it, and also feeds Queen Bean a Belly Blech worm, which turns her into a monster. She then encounters the Mario Bros. again in Beanbean Castle (in the disguise of Lady Lima, whom she had imprisoned in the sewers) and tricks them into fixing the castle's plumbing, which turns off the Beanstar's security system and allows Cackletta to steal the Beanstar. Mario rushes up to the throne room to stop her, but it is too late; Cackletta and Fawful get away and leave Queen Bean, under the influence of the worm, to take care of the Mario Bros. Later, Cackletta goes to Woohoo Hooniversity to carry out her plans with the Beanstar. After Queen Bean is restored to normal and the Castle Town is repaired, the Mario Bros. (as well as Prince Peasley) travel to Woohoo Hooniversity. Cackletta activating three Peach-bots, which are robots programmed to play a perfect copy of the stolen voice. Cackletta's plans backfire, however, when she attempts to use Peach's voice by putting the voice in robots codenamed "Peach-bots". It is later revealed that Toadsworth and others of the Mushroom Kingdom avoided the Plot and switched Peach with Birdo, whom they dressed up like Peach. As a result, the Beanstar becomes furious by Birdo's voice and does not help Cackletta at all. Instead, the Mario Bros. come and give her a surprise attack at the wrong time (for her), and the pair finally battle Cackletta. Cackletta's main attack during the battle is creating lightning bolts to strike the brothers. The arm she lifts for this attack show whether she'll attack Mario and then Luigi, Luigi and then Mario, or both at once. She can also create two clones of herself, so when one of the duplicates is attacked, it divides into a swarm of Cackletta-like bats and attack the brothers. They aren't very dangerous because they only cause very little damage, although they can give venom if Mario or Luigi make contact and will poison the Mario Bros. When the real Cackletta is attacked, the fake ones disappear. In order to figure out which Cackletta is the real one, the players should look at which arms each of them raises to do the lightning attack. The real Cackletta will raise both of her arms, attempting to strike both of the brothers at once. Cackletta also has a special attack where she makes voids in the ground that move toward Mario and Luigi, so they can fall in and drop from the top of the screen and hit the ground while making them heavier. This attack causes Heavy G. She can only use this attack once at the very beginning of the battle, and also near the end of the battle. Her clone attack in the 3DS remake is changed slightly: the real Cackletta laughs briefly while the rest do not. After doing so, she will also attempt to switch places with one of her clones multiple times to confuse the player. She also clones herself far less frequently than she did in the original game. They fight until Cackletta is so badly injured, she cannot move. Fawful comes and absorbs Cackletta's body in his "headgear". Cackletta then commands Fawful to do one more attack for her, however, he is stopped by Prince Peasley hitting them with his sword and knocking them out of Woohoo Hooniversity. Cackletta's ghost about to possess Bowser's body. Bowser is lying unconscious in the Mushroom Kingdom side of Stardust Fields when Fawful lands there, too, and puts Cackletta's ghost into Bowser's body and thus, the birth of "Bowletta". Now that Bowletta can control Beanbean minions and Koopa minions, she is more powerful than ever and plots to steal the Beanstar again and get the real Peach's voice. She succeeds in kidnapping Princess Peach in Little Fungitown while Mario is sick and Luigi is away. She then offers a deal with the Mario Bros. through a video recording: find the Beanstar pieces and fix them, then give her the Beanstar and she will return Peach. The brothers' friends at the castle realize that Bowletta is probably tricking them and not planning to return Peach. Prince Peasley has a plan to give her a fake Beanstar and meet them at the top of Joke's End. After many long battles, the Bros. finally make it up to the top of Joke's End. Luigi gives Fawful the fake Beanstar, but Fawful sees right through the disguise and knocks down the Bros'. suitcase. Mario follows after Luigi and they have an idea. Mario and Luigi come to Bowletta, but Bowletta refuses to honor the deal and release Peach. A few minutes later another Princess Peach comes out along with Mario, holding her mouth. Mario cracks up and Bowletta understands that the Peach she's holding is a fake. She drops the Peach she's holding and grabs the other. They then go to the Koopa Cruiser and ask her why she's holding her mouth, but she doesn't respond. Then Bowletta scares her to reveal a big mustache, and the "real" Peach turns out to be Luigi, forcing him to make a getaway. In the mean time, Bowletta plans a plot to destroy the Beanbean Kingdom and then, after the Bros. are destroyed, the Mushroom Kingdom. She goes in Bowser's Castle and successfully destroys Beanbean Castle Town. The Bros. go to Hoohoo Village and tell Blablanadon that Bowser's Castle is overhead and now he should take them up. Fawful then informs Bowletta that the Mario Bros. are coming so Bowletta orders the seven Koopalings and Fawful to guard her castle. The Bros. fight them all and eventually fight Bowletta until finally she gets an idea. She pretends to be defeated and then, when they let their guards down, she summons a Time Bob-omb to explode at them. It works and she subsequently swallows them. Inside Bowletta's stomach, Mario and Luigi, barely conscious, find Cackletta's spirit inside of the body and fight her. Mario and Luigi battling Cackletta. The brothers start the boss fight with 1 HP, so it is recommended that they quickly heal on their first turn. In battle, Cackletta will use aura attacks against the Mario Bros., and they must destroy both of her arms and her head in order to expose her heart. When her heart has been exposed, the Mario Bros. must attack it to finally destroy her and complete the game. With Cackletta's exposed heart, she will use it to revive her head and arms, and then heal them as well. After two full battle rounds of Cackletta's heart being exposed, she will conceal it once again and the entire process repeats. One of Cackletta's attacks is to create an enormous energy ball that will attempt to crush one of the Mario Bros. The Bro must attack with his hammer constantly until it explodes. Another attack is when she stretches her arms out at the Mario Bros., attempting to flick them. This can be countered by hammering her hands quickly. Her hands also attack. Her right hand summons two fireballs to rotate around the Mario Bros., which should be dodged by jumping at the right time. Her left hand summons a ball of electricity that must be hit with a hammer. Hitting it will make it slide to the next brother and this must be repeated until it breaks. Her hands can also attack by sweeping both bros. This attack is similar to Elder Princess Shroob's tentacle sweep and the Dark Star Core's laser attack. Cackletta's head also has the ability to partially heal either itself or one of her arms or heart (only when exposed). It can also boost the attack power of itself or one of her arms as well. When Cackletta's HP is down to half or less, she will have three new attacks. She will move her eyes up or down, indicating where she is going to fire a beam for each Bro. If her eyes move up, she is going to fire upwards. If they move down, she will fire downwards. Mario and Luigi must jump or stand in the right position before Cackletta freezes time in order to dodge the beams. She also summons a mirage of Fawful that will shoot streams of energy balls at the brothers before closing in on one of the Mario Bros. Mario or Luigi must quickly hit it with a hammer or else it will continue to shoot more energy balls. Yet another attack is to create balls of aura. The pink balls target Mario while green balls target Luigi. The balls also teleport to different parts of the screen. Also, if the brothers try to attack the head while either or both of the hands are still active, the hands will counterattack immediately afterwards, either by sweeping the floor or attempting to flick the brother that just attacked. In the 3DS remake, some of Cackletta's attacks are changed. Firstly, she is able to use her laser beam attack from the very start of the battle. Her fireball attack also doesn't last as long, and the electric ball attack has the electric ball move closer to the brothers every time it is hammered. Thirdly, Cackletta has an additional ability not seen in the original game: she can raise her arms over the Bros, and then bring them down on top of them. This attack can be countered with the hammer. 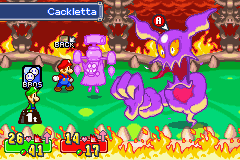 Many of Cackletta's attacks are also more powerful in the remake. After Cackletta is defeated, her spirit leaves Bowser's body, disappearing into the afterlife and Bowser returns to his original form. Although she is rather comical, Cackletta is extremely selfish, and having a stereotypical witch-like personality. Her only example of compassion is for her beloved minion, Fawful. She will do anything to eagerly get what she wants, such as flying directly from her homeland to stir trouble, and swipe the voice from Princess Peach in order to awaken the Beanstar for her own personal gain. She even attempts as far destroying the Beanbean Castle, the capital of her own home, to swipe the artifact. From beginning, to midway, Cackletta easily gets tricked twice, meaning she could be easily gullible or plainly fueled by her highly self-absorbed attitude, especially prone to getting angry at her own mistakes. Cackletta and Fawful disguised as the Goodwill Ambassadors. Cackletta is quite tall, appearing to be about twice the height of the Mario brothers. She has green skin, like most members of the Beanish species. She has large, pink eyes, an elongated head with a large mouth and jagged teeth, and large purple horn-like objects on top of her head. She also has an India-style bead on her forehead, which does not appear in her other forms (this is later fixed in the remake, in which she bears it on her soul). Cackletta wears a large purple robe with a pink undergarment and a yellow rim. When she raises her arms during the battle against Cackletta, the sleeves of her cloak are revealed to be very large and roughly frayed on the edges. These are somewhat reminiscent of bat wings. In order to disguise herself as the Goodwill Ambassador from the Beanbean Kingdom, Cackletta dressed in a one-piece yellow suit during the game's opening sequence, taking on the appearance of Lady Lima (Queen Bean's royal advisor). While Cackletta possesses Bowser and takes the form of Bowletta, she has the same body as him, but retains her facial appearance. She also has two yellow breasts on her chest. Cackletta's soul as it appears in Mario & Luigi: Superstar Saga + Bowser's Minions. In her soul form, Cackletta is a massive, floating, gaseous creature with no legs, two arms, and an enormous head (still bearing her trademark horns). Cackletta's head wears a perpetually blank expression with a large tongue, and (in contrast to Cackletta's other forms) has orange eyes with visible black pupils. 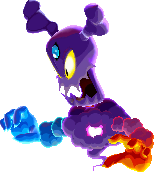 Cackletta's main color is purple in this form, with her heart being pink: the heart is initially embedded in her cloudy body and only becomes fully visible (and vulnerable) when Cackletta's head and arms are destroyed. Cackletta's soul is redesigned in Mario & Luigi: Superstar Saga + Bowser's Minions, becoming much larger, with newly color-coded hands denoting the elements they use: her left hand is red for fire, and her right hand is blue for lightning. She also now has a blue gem in her head, and her eyes are now a clear yellow instead of bloodshot and orange. As her health decreases, Cackletta's colors change to red with green eyes and heart and a gray gem. Cackletta's soul also uses a 3D model instead of a 2D sprite. The witch seems to mainly have powers based on pyrokinesis and electrokinesis, much like the Mario Bros. themselves. She also has the ability to create clones of herself that can split into many bats with the ability to poison featuring her likeness. She also send voids that travels across the ground towards the Bros. which falling into them alters the brothers' weight. This indicates she has magical abilities. Her powers are greatly expanded upon when she is later fought inside of Bowser's body where she can use aura attacks, create a pseudo-Fawful to attack, launch enormous balls of energy, and even stop time to fire laser beams from her eyes at her opponents. She can also replace someone's voice with "explosive vocabulary", which is best demonstrated with her theft of Peach's, or rather, Birdo's voice, with the explosive vocabulary being potent enough that Bowser was forced to put kidnapping Peach on hold due to it otherwise risking extreme damage to his castle holding her inside. Cackletta is also stated to be a master of disguise that can imitate almost anyone, but is only seen mimicking Lady Lima in the earlier portions of the story, an ability similar to that of Mimi. She retained this ability when she was reborn as Bowletta, as demonstrated in the Minion's Quest mode for the remake, where she posed as Bowser. She also appears to excel in mechanics due to the fact she pilots a rocking chair-like device and built Peach-bots in order to fulfill her plan in using the Beanstar. "Eeeyah ha ha ha ha!" "Who would have thought you'd catch up to the Great Cackletta in even a hundred million years?" "Perhaps the three of you can sit down over tea to discuss the finer points of foreign policy!" "The moment when all the world will bow down to me has come at least..."
"Pests! Loathsome pests! And at the worst possible moment!" "I'm going to knock you all the way back to the Mushroom Kingdom!" "I shall dispose of you quickly and then eat you for lunch!" "EEYARGH! It can't be!!! Impossible!!! I... No... How could I... And to this filthy little pair! HOW COULD I LOSE?????" Geragemōna From geragera, an onomatopoeia for mean laughter. Spanish Bruja Jijí Heehee Witch (referring to her laugh in the Spanish version). French Graguémona From the Japanese name. German Lugmilla Pun on the German name Ludmilla. Italian Strega Ghignarda "Strega" means witch, "ghignarda" comes from "ghigno", grin. Kkalkkalkkalmanyeo From the Japanese name; 깔깔 kkalkkal is one of a sound of laughing in Korean. From 깔깔 kkalkkal and 마녀 manyeo, meaning "witch". Gēgēmònà From the Japanese name. While preparing for the true fight with Fawful in Mario & Luigi: Superstar Saga and he mentions Cackletta, her name is misspelled "Cakletta." This error is not present in the remake. A small part of Cackletta's theme can briefly be heard in the music for Princess Peach's Castle after Fawful's takeover in Mario & Luigi: Bowser's Inside Story. In the Woohoo Hooniversity boss fight, Cackletta gives 300 EXP in releases outside of Japan. However, due to a glitch, this amount is multiplied by 3, causing her to drop 900 EXP instead, which is more than the next two bosses, Popple/Rookie and Mom Piranha. In the French version of Mario & Luigi: Bowser's Inside Story, after the defeat of Dark Bowser, Fawful says "J'ai joué les sbirrres... pourrr une hystérrrique..." ("I played the henchman for a hysteric...") in reference to Cackletta. This would imply that he did not think highly of his former leader. Cackletta's battle theme (which she shares with Fawful in Mario & Luigi: Superstar Saga + Bowser's Minions and the Japanese version of Mario & Luigi: Superstar Saga) is remixed for the battle against Dark Fawful in Mario & Luigi: Bowser's Inside Story + Bowser Jr.'s Journey.